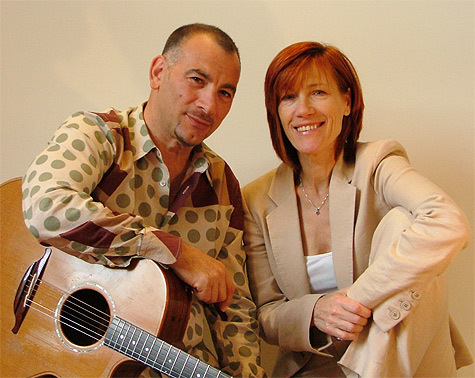 FILMED AND RECORDED LIVE at Bray Studios in February, 2007, Under The Night Sky brings together Kiki Dee  whose career spans over 40 years  and her music partner Carmelo Luggeri with an exciting 20-track set that includes Kiki's songs, unique covers and fresh material that takes Kiki in a new direction. and became a superstar on both sides of the Atlantic. on the QE2: "We've already booked the caravan holiday, love!" A survivor, Kiki successfully beat breast cancer some years ago and  like many people under the same circumstances  she finally discovered who she is and what she really wants from life. Her recent work with the talented guitarist, writer and producer Carmelo Luggeri, has given Kiki a new direction  an inspiring and exciting journey during which they revisit former successes and international hits with new interpretations. This is a magnificent collaboration that has spawned a new collection of intelligent, well-crafted songs to enchant both new and old fans. her heart into her singing. She has included tracks from two of her albums, Walk of Faith and Where Rivers Meet  which was the first time Kiki had written lyrics for a whole album. One of the best tracks on the Under The Night Sky DVD is Learning To Fly, written by Tom Petty and Jeff Lynne. This song suits Kiki's voice and she sings it tremendously well. Other gems are Nobody's Child (written by Kiki and Carmelo); the magical, emotive and unforgettable Amoureuse from 1973 (written by Veronique Sanson and Kiki's lifelong friend Gary Osbourne); Don't Go Breaking My Heart (A Orson/Carte Blanche)  a hit duet in 1976 for Kiki and Elton John; How Sweet It Is To Be Loved By You (Holland Dozier Holland); and a song that Kiki sings with attitude, I've Got The Music In Me (Bias Boshell). Carmelo is a huge Peter Gabriel fan and he and Kiki included the wonderful Digging In The Dirt as an experimental song. Kiki says it sounds different every time you perform it. She also gives a creditable rendition of Kate Bush's Running Up That Hill and Kate herself con-tacted Kiki to voice her approval. Kiki is also proud of the first song that she and Carmelo wrote together, One And Only Love. The title track, Under The Night Sky, is also a great song. 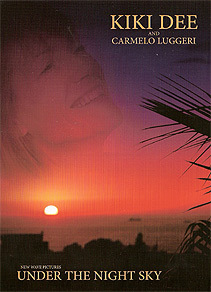 For the Under The Night Sky DVD, Kiki Dee's role was vocals and keyboard with Carmelo Luggeri on guitar and vocals. They were also joined on stage for a number of tracks by Claire Finnimore playing the viola and also by recording artiste Annabelle Lamb. and distributed by Eureka Entertainment to coincide with a 20-date tour commencing on 17 March (2008). Catalogue No: NW80002 | RRP: £14.99 | Running Time: 100 Minutes. Kiki Dee and Carmelo Luggeri, with detailed track by track analysis. Heart | Just Killing Time | Digging In The Dirt | One And Only Love | Salty Water | Like Nobody's Child | Running Up That Hill. Part 2: Amoureuse | Amen And Goodbye | Under The Night Sky | Oh, Life | A Very Good Year | Until We Meet Again | Everybody Falls 2 | I've Got The Music In Me | How Can You Mend A Broken Heart | How Sweet It Is (To Be Loved By You).